If you've ever looked down at the Cheeto in your hand and thought, "Hey, this kind of looks like a Hammerhead shark." Well, congrats. Also, you might have just won $60,000. 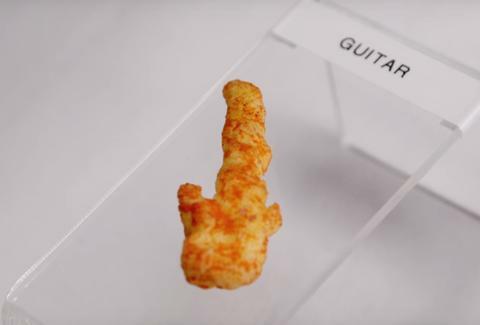 OK, it's not quite that simple, but Frito-Lay is running a contest right now that will award weekly winners $10,000 for their weirdly shaped Cheetos. In addition, one grand prize winner chosen by the American public will get an additional $50,000. That's $60,000, all because you found a Cheeto that looks like John Belushi. As noted in the press release, the purpose of this contest is to search for the next "Mona Lisa of Cheetos shapes," and to eventually display these award-winning Cheetos online and in a physical museum space. Yeah, it's all pretty strange. But hey, free money! To enter, US residents over 13 years of age can upload a photo of their Cheeto masterpiece on the Cheeto Museum website until August 15, 2016. And make sure to preserve that Cheeto for authentication purposes. Someone will check to make sure there's no Cheeto tampering going down. Keep in mind that the competition is tough. Some Cheetos already featured on the website are uncanny, like Cheesebraham Lincoln, Statue of Libercheese, and Cheesegull. That Hammerhead shark you found might not cut it. But it can't hurt to try. Kara King is a News Writer at Thrillist and is covered in Cheeto dust. Send news tips to news@thrillist.com and follow her at @karatillie.